With whisk, stir in taco seasoning mix. Stir in black beans and corn. Increase heat setting to High; cover and cook 15 to 30 minutes longer or until thickened. Note: This recipe was tested in slow cookers with heating elements in the side and bottom of the cooker, not in cookers that stand only on a heated base. For slow cookers with just a heated base, follow the manufacturer’s directions for layering ingredients and choosing a temperature. 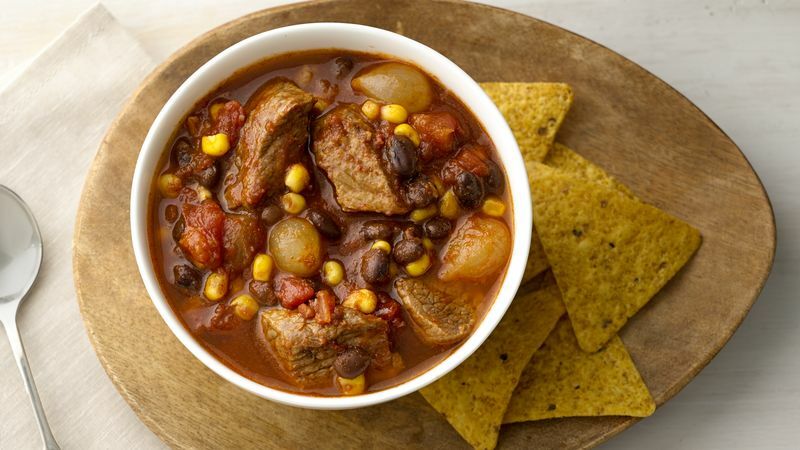 Serve this stew topped with shredded Mexican cheese blend and chopped fresh cilantro leaves for an extra-special touch. Frozen small whole onions, also called pearl onions, are loaded with flavor and are so convenient to use. If you don’t have them on hand, you can substitute 1/2 cup chopped onion.